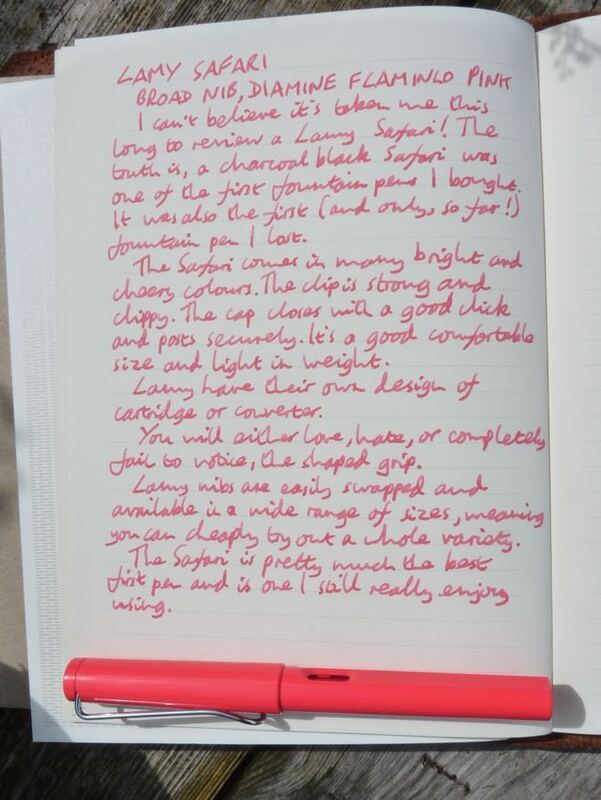 Lamy Safari Fountain Pen Review – Pens! Paper! Pencils! This site is over three years old and I’ve not reviewed the Lamy Safari until now. How can that be? Perhaps because it’s never been new: the Safari was the first fountain pen I bought as a proper grown up. (Also the first, and so far only, fountain pen I lost.) If you live in western Europe then they’re almost ubiquitous, too. Most high street stationers, and many newsagents, will stock a few Safaris. Ubiquity doesn’t equate to quality, of course. If it did we’d all be using biros. Is the fountain pen world benefitting from the Safari being so many people’s first pen? Should it be in your collection? Should you recommend it to a friend? Let’s see! As standard, the Safari’s available with the usual range of steel nibs, including a left-handed one. Being right-handed I can’t comment on the left-handed nib but a few left-handed people have told me that having adapted their writing to accommodate the usual style of nib, the left-handed one causes them difficulties. If you pick a Safari up in a high street shop you’ll probably have to buy it with a medium nib. You can also buy replacement nibs very cheaply and these come in a few more sizes: 1.1mm, 1.5mm and 1.9mm italics as well as an ‘A’ nib, which is meant for beginners and is like an extra round medium. Many of these nibs are available with a black rather than chrome finish. You can also buy gold nibs that will fit, and are wonderful, but will cost you around four times as much as the pen itself (in the UK). Lamy’s steel nibs tend to be pretty good. There’s the occasional rogue but on the whole they’re smooth and have good flow. They aren’t exceptional but they are plenty good enough. What this means if you have a Lamy pen you can, for not too much money, try a wide variety of nibs to see which widths suit you best, or use the same pen for everything from making small notes in a margin to calligraphy. The nibs simply slide on and off so you can even change them without having to clean the pen (if you don’t mind inky fingers). 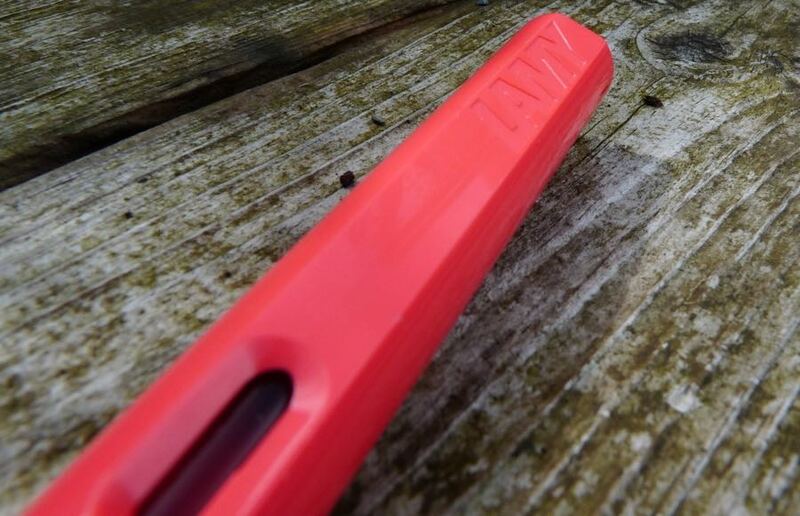 As well as a wide variety of standard colours Lamy produce a special edition each year, with a matching ink. This coral pink pen was one such. These special editions can sometimes fetch quite a premium but it means you can probably find a colour you can love (especially if you love green). The barrels are plastic but even if the colour is, say, black, the Safari feels like a cheerful pen. 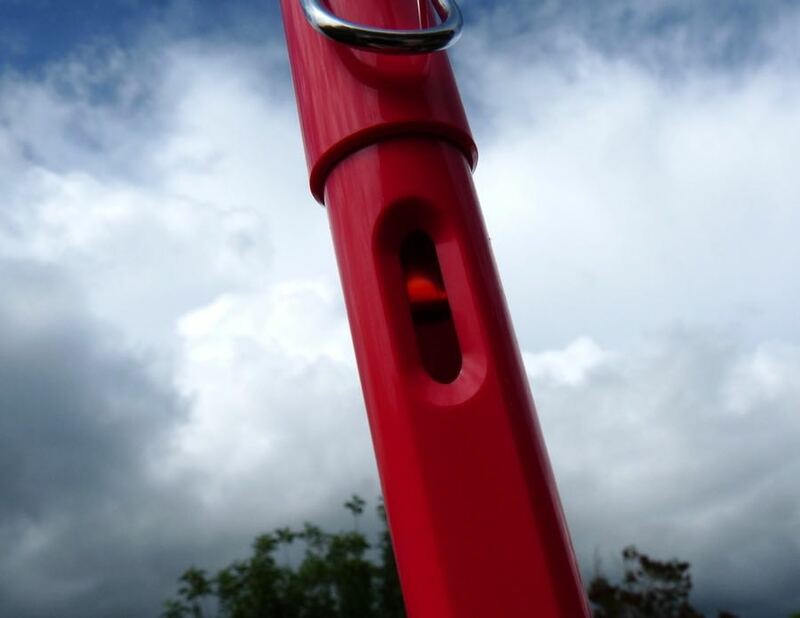 If you have a one in a bright colour then it just fills you with joy. I much prefer the Safari to the more expensive aluminium AL-Star because of this. The cap pushes on to close and to post (which is does so securely). Being a light pen the balance isn’t effected if you post the cap. It’s a good comfortable length whether posted or not. 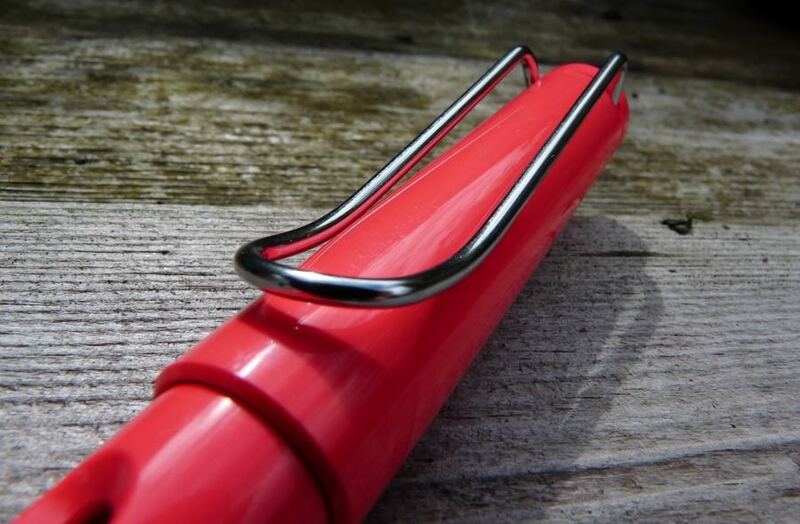 The metal clip is distinctive, strong and very clippy. Lamy use their own size of converter or cartridge. Cartridges are easily found on the high street (but often only in blue or black). 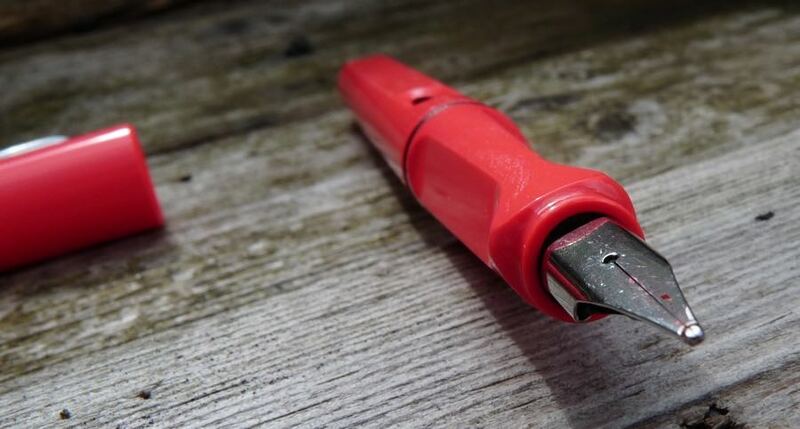 You’ll usually have to pay extra for a converter: they’re not expensive as such but they are relatively expensive compared to the cost of the pen. I’ve always found Lamy converters to be well made and reliable but I do wish they’d shorten the length of the knob and increase the length of the cylinder. There’s a useful ink window for keeping an eye on how much ink you have left. The most controversial part of the Safari is the grip. It’s triangular and you’ll either not really notice it or hate it. 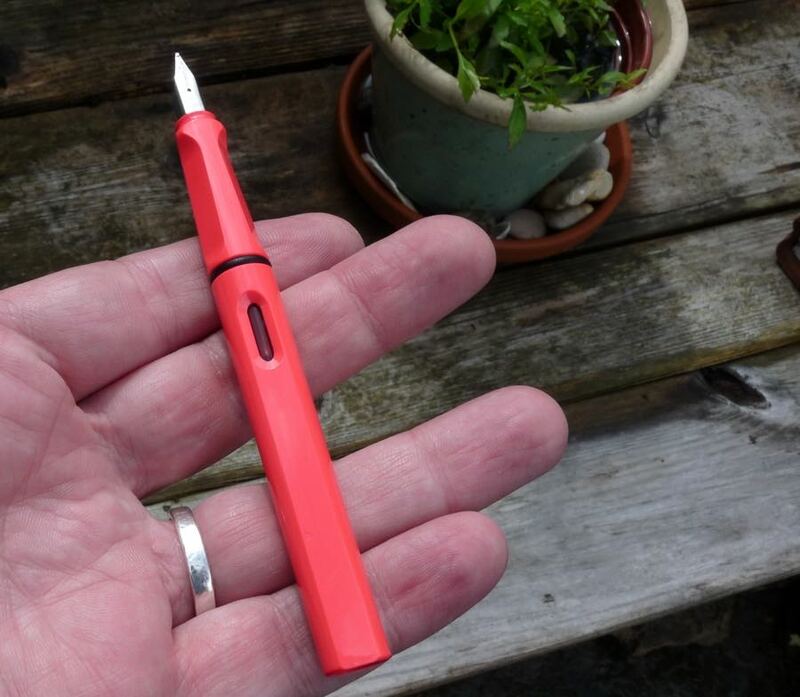 Some people are philosophically opposed to it’s attempt to impose what Lamy considers a good grip onto their right to write anyway they like. I’m in the don’t-notice-it camp but I do think that if Lamy used a round grip here it would make the pen accessible to more people. There are lots of people who just don’t get on with this grip because that’s not how they hold their pens. 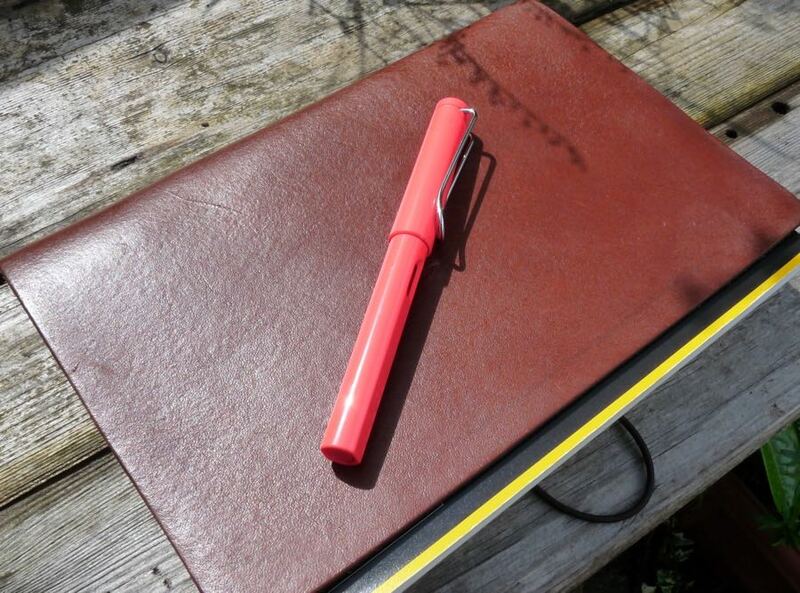 You can find many more reviews of the Lamy Safari on Pennaquod. I’m lefty and I have a Lamy, I don’t find the grip ucomfty. it is a great pen indeed.! I was initially attracted to the Lamy Safari and the Al-Star because of the unique design. I prefer the aluminum Al-Star; I just like the look of the colors done in aluminum. They have a nice, deep shimmer. Only one problem with Lamy for me: I almost never get a decent nib! Maybe it’s just my bad luck, but almost every Lamy I’ve ever bought (and I bought several, being an eternal optimist) has been kind of scratchy and has needed tuning on Micro Mesh to write decently. I did have a little better luck buying the 1.1 mm stub nibs and replacing the original nibs with these. I still had to tune those stub nibs a little, though. I eventually gave up. I have several Lamy fountain pens, but don’t use them very much. Pity. I still like the unique design of the Lamy. Exactly the Safari in a mate kind of black had been my school filler almost all the time I’d spent there as a student after elementary school. By the way, I’m german! I just have bought one another black Safari – among other reasons as the superb writing and lightweight are, to re-awake the good old memories of course – but, – shame on me! – in the more shiny version, which more appeals to my eyes in general. It runs extremly well over a large variation if paper, with always good wet flow. (Decades of years ago, I held a drier one in my hand, as I remember well).